For many anglers the perception of winter steelheading is that of winter weather, cold snowy, slushy and rainy days spent endlessly trudging up and down endless miles of riverbanks. Boy does that ever sound like a lot of fun. Winter steelheading for many is a December, January and February pastime. Dealing with inclement weather is a given and is an accepted part of this winter fishery, it certainly weeds out the men from the boys. Anglers who are consistently successful at catching winter Steelhead all share a common commitment, they all put in there time, learn the water and pay attention to the small details that can make big differences. One of the first rules of any type of fishing is to fish where and when the fish are in. 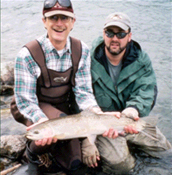 You simply cannot catch Steelhead if they are not there. 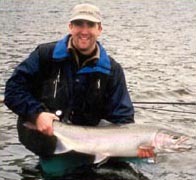 It is widely understood that winter steelhead are available in the winter months of December, January and February but what many anglers fail to realize is that many river systems throughout British Columbia, Canada continue to fish well or even better in the spring months of March, April and even May! It never fails to amaze me how many anglers pack it in during the month of February figuring that the season is over when some of the best fishing of the year maybe just around the corner! One of the best benefits of fishing for late Steelhead is the weather. Springtime is one of my favorite times of year to be outside. The spring can at times be a little soggy but it is much warmer than the winter weather and some times it can be very sunny and warm. A warm spring day spent Steelheading is for me about as good as it gets; every thing is new and fresh and it is a pleasure to be out side. Another big benefit to spring Steelheading is that the pressure from other anglers is way down. I guess some of these guys have yard work or other chores to get done at home during the spring. Some people just have to get their priorities straight. 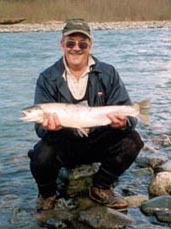 The best benefit to late winter or spring Steelhead fishing has to be the fishing, as far as I am concerned it is the best of the season because the conditions that make the fishing better for us above the water are also are good for the fish in the water. Warmer water temperatures are responsible for more aggressive and more active fish, less pressure from anglers (the guys now at home doing yard work) means that the Steelhead are less weary (thanks guys, your lawn will look fantastic) and the best part about spring fishing is that there are more fish! You just can't beat it; better weather, less people, more aggressive fish and just plain more fish, it's my favorite time on the river. During the months of March, April and May the numbers of steelhead that are in the river are at there peak, early winter run, middle winter run and spring run fish are all present and all are in different stages of there spawning cycle. It is very possible to catch Steelhead that are fully colored, spawned out and recovering as well as fish that are chrome bright and fresh from the ocean all in the same day. Personally my best days numbers wise have always been during the springtime season. Springtime is also a time that the Steelhead will become far more aggressive and quite frankly much easier to catch. Early in the winter when water temperatures are freezing Steelhead will not move very far to intercept a bait and can be much more finicky but as the spring time approaches Steelhead do however go through a distinct attitude change, no question about it. Whether it's the warmer water or the stress and changes of their impending spawning duties these fish definitely become way more aggressive and will frequently chase down and attack baits that only a few weeks earlier they would barely even notice. Spring run fish also tend to stick together more so when you find one you will usually find others in the same location. Many of the techniques that work for early run winter fish will work for late run or spring run steelhead as well. Lets face it, the fish are the same, only the time of year has changed and the weather has become warmer. Angling for late winter or spring run Steelhead also requires the angler to go through an attitude change as well. Granted to be a consistently successful Steelheader you must be aggressive in your angling to start with but when the spring rolls around a change in approach will further improve your success on the river. Early winter Steelhead fishing requires a methodical and almost painstaking approach to covering water, you need to get to the bottom and pretty well cover every inch of fish-holding water several times and present several baits to make sure that no fish are passed over. When fishing early season Steelhead most anglers will float fish using pencil lead as there means to fish deep and keep their baits down and keep in constant contact with the bottom of the river. By fishing in this manner you keep your bait at eye level and sooner or later you will present your bait in front of a fish. This is crucial because during early season when the water is cold Steelhead will rarely chase down or move far to intercept your bait. Many of the basics do stay the same when fishing for late winter or spring run. With steelhead, as a matter of fact you could change nothing about your approach and still do well, however the springtime offers some unique opportunities to anglers and we might as well take advantage of them. The biggest factor in the spring is that the Steelhead themselves are more willing to bite, in fact in many cases Steelhead will go out of there way to eat a bait. It is still important to cover the water efficiently and carefully but less time is required before moving on. Probably the one most over looked area of springtime, steelheading is the terminal rigging that an angler uses. Early wintertime requires angler to crash the bottom of the river. In springtime however this is no longer necessary. A natural drag free drift with your bait suspended between 1 and 2 feet of the bottom of the river is deadly at this time of the year. The best way to obtain this is by substituting split shot over pencil lead for a weight system. When fishing split shot it is important to make sure that the shot is spaced evenly along the line every four to six inches starting at the swivel and working on up to the float. Make sure to use enough split shot to properly load the float, no more than 1.5 inches of your float should be visible while it is drifting down the river. This allows for proper strike detection because during this manner of float fishing the bait is suspended well off, or short of, the bottom of the river. I refer to this technique as "short floating." Note when using split shot make sure you are off the bottom because if you are not this stuff snags like crazy and you will be retying often. Short floating for spring run steelhead does require a few favorable conditions first the water clarity must be good at least 5 to 6 foot of visibility. Also, water temperature must be appropriate; usually by early to mid March winter run fish will sense the warmer water and really wake up. I don't feel that these fish are looking to feed but they certainly react differently to bait. I have watched Steelhead in the springtime come from across the pool and chase down a bait that was fished using the short float method on several occasions. It is really exciting watching your float drift down the river because with your bait suspended off the bottom when the float drops it is a fish. No false alarms and because the Steelhead has usually aggressively attacked you bait as opposed to a gentle take you do tend to get a better hook set and therefore land more fish. Fishing the short float system is not much different than fishing with pencil lead, just remember to cast slightly farther up stream to allow your gear to sink and set up as this takes slightly longer than with pencil lead. Also do no apply quite as much tension to the reel spool while drifting down river, a smooth, natural, drag-free drift is what we are trying to achieve, overly slowing down the bait is not necessary. To this point I have not mentioned a lick about the many different and varied types of baits an angler may fish for Steelhead. For the most part I feel that too much emphasis is placed on what type of bait to fish and not enough on how to fish properly. Steelhead can be caught on many different baits be it organic or artificial. How and where you fish is as important as what bait you fish! Now having gone of on my little bait rant I will admit that certain baits do lend themselves to certain techniques better than others. The Baits that do tend to fish well while using the short float method are baits that lack buoyancy or at least have neutral buoyancy. Because we are purposely fishing off the bottom, we will want a bait that will sink somewhat on its own we don't want our bait floating up amongst out split shot. Bait selection is also dictated somewhat by water conditions. If the river is low and clear then go small conversely if water clarity is limited then fish with a larger bait. I have found that having an open mind to bait selection has improved my success over the years. Every time you fish a new run or pool you should take the time to fish several different baits. No one bait will appeal to all Steelhead on any given day, so sticking to a single bait is just like not fishing all the water in the pool or run in front of you, you are passing up available fish! Some of the more productive baits that I have found for the short float technique include Jenson egg and yarn combos. This is a very versatile bait color and sizes are almost unlimited, these baits fish very well under medium to good visibility. Organic baits such as ghost shrimp, fresh boraxed Steelhead roe and single eggs tied in spawn sacks can be deadly in all water conditions. Adding a corky or a spin and glow can also be a good added attraction to any organic bait. Rubber worms are an excellent bait they come in a variety of colors and sizes, pink, peach, white and orange are all productive colors. Many anglers think that rubber worms are only a good bait in colored water or when the rivers are running high and this is true that they do work well at these times, however personally I never hesitate to fish worms especially in the spring. Rubber worms usually attract aggressive strikes and since spring run Steelhead are already in an aggressive mood this bait can have a real impact regardless of river water levels or clarity. Colorado blades are another impact bait. These simple spinners are also deadly fished under a float. Steelhead will attack blades with a vengeance. Blades fish well in water levels that are at medium-to-medium high and with visibility beyond 4 feet. Rubber worms and Colorado blades usually create a response in short order so I recommend fishing them as the final bait through a run or pool. Steelhead fishing in British Columbia, Canada is second to none, as anglers we are blessed to live here and take this wonderful fishery for granted. After several years working in the sport fishing industry I have constantly been amazed at many anglers willingness to accept mediocre or even poor angling success simply because they are either stuck in their ways or just unwilling to accept some new ideas that may improve there success. Anglers who are consistently successful are always willing to be innovative and are constantly looking for a new edge. Good Steeelheaders will put in their time perfecting their techniques and will always be looking for new water. To be a successful Steelhead angler you must be willing to take into consideration all the variables, time of year, water conditions, location, terminal gear and last but not least bait selection. Steelhead fishing more than anything requires the right attitude, be willing to put in you time keep your eyes, ears and mind open and above all pay attention to the little details. Fishing for Steelhead is a lot like building a puzzle except this puzzle changes every day, those anglers who can adapt will do well those who can't or won't just leave more fish available for those of us who can.